About a year ago, I experienced one of the hardest working days of my life. It was the first day I chaired a meeting of a new 20-ish person taskforce on green growth and poverty reduction. It sounds odd and a little laughable now, especially now that a year has passed and that the group has concluded its work (our work will be published in a few months time). But I think the reason I found that day hard was because I wasn’t used to chairing such a large group, particularly not in such a formal setting. 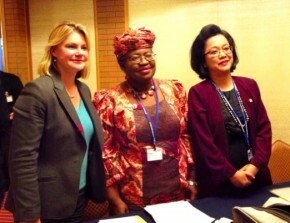 So when I watched, just over ten days ago, three women ministers – DFID’s Secretary of State Justine Greening, Planning Minister Armida Alisjahbana from Indonesia and Finance Minister Ngozi Okonjo-Iweala from Nigeria – co-chair a group of about the same size getting together for the first time, I was impressed. Of course, these ministers had chaired large groups before. And there are lots of guides out there about how to make every meeting matter. We all know the tips: make sure people come to the meetings prepared; make sure the room is set up so that it feels physically inclusive; have a clear agenda and vision for what you want to get out of the meeting; be open to new ideas, and be ready for detractors too. In the case of last week’s meeting, the first meeting of the Steering Committee of the Global Partnership for Effective Development Cooperation, several people had been involved in making it matter. The Support Team, made up of officials from UNDP and the OECD, had worked really hard to write the key documents for the meeting and circulate them in good time. They, Nigerian and Indonesian officials and I had been working together to design a clear and stimulating agenda. The EBRD, where the meeting was being hosted, had people on hand to deal with all the logistics and ensure the sessions could be filmed. The 15 non-ministerial Steering Committee members had been preparing their own contributions, contacting colleagues from other countries and organisations to ask them their views, including on progress they’d seen (or otherwise) on development effectiveness over the past year, and the specific documents that had been circulated.The secret ingredient, however, was unknown to all of us until the meeting actually began. The secret ingredient was the three ministers. Their special contribution was to bring leadership to the table. As business lecturer Robert Pozen describes in this interview, there are two typical chairperson styles that are used in meetings. The first style is to be open and ask everyone what they think should be done. This is problematic because it lacks structure, and can lead to a lot of time wasting. The second style is what Pozen describes as authoritarian – where the chair gives their views and asks for a response. This technique can scare people into simply acquiescing. Neither techniques are particularly effective or inclusive. Pozen recommends a third technique – designed to focus discussion and encourage debate.And this is what I saw the ministers deliver at this first meeting. As you’ll see from the videos of the sessions, the ministers opened by putting forward a number of areas they felt needed action. They gave structure by setting out the major challenge – working out what change and success for development that the Global Partnership, now that it is formed, might deliver. They each offered a suggested path, but invited Steering Committee members to support their views or give alternative suggestions. Through this leadership, the ministers were able to gather consensus around the table that the Committee should work on four to five initial topics, which members will write papers on, and which will be shared and discussed with the international community in the early New Year. They also agreed that the Steering Committee will meet again in March and June/July next year and made plans for a bigger ministerial meeting in October 2013, modifying some of the suggestions that had been set out in the papers circulated in advance. The effective chairing was all about leadership. In retrospect, I think I managed to provide some leadership to the green growth and poverty reduction taskforce that I chaired over the past year. But I know I’ve still got a long way to go if I want to deliver as decisive, un-bureaucratic and inclusive a meeting as I saw a few days ago. Though there is still a great deal of work to do, it was certainly a successful first meeting, and my hope is that as a result, the other Steering Committee members will be energised in future to come up with new ideas and challenges. We have an exciting year ahead.